Built in 1923 in Lake Worth, Florida, the 106-room Gulfstream Hotel is on the National Register of Historic Places. Several developers salvaged the hotel from a long-running foreclosure lawsuit and it is currently under renovation. The hotel is reportedly haunted by the ghost of a six year old girl. When the hotel was open, she would allegedly turns on TVs, make prank phone calls, cause the lights to flicker, and tamper with the elevators. The ghost has been known to tap people on the shoulder and tug on women's skirts. According to staff, the hotel was the scene of a tragedy, back in the 1930's, when a young girl fell down the elevator shaft and died. Our paranormal investigation video from PRISM's September 19, 2015 visit to the Gulfstream Hotel in Lake Worth, Florida. A huge thanks goes out to Robb Demarest, and Scottie Burns of War Party Paranormal for inviting us to investigate this historic location with them. Equipment used in this video: Sangean DT-200X ghost box, Paranologies 360 Parascope, Ovilus 4 ITC research device. Four electronic voice phenomena (EVP) audio clips from a paranormal investigation of the Gulf Stream Hotel in Lake Worth, Florida on February 27, 2016. All four audio clips were recorded on a Panasonic RR-DR60 Digital IC Recorder by PRISM founder David Pierce Rodriguez. Robb Demarest (Ghost Hunters International / Haunting: Australia / Destination Truth), Tim Yancey (War Party Paranormal / A Haunting), and John "Zap" Aderholt (War Party Paranormal) can also be heard in the EVP session recordings. 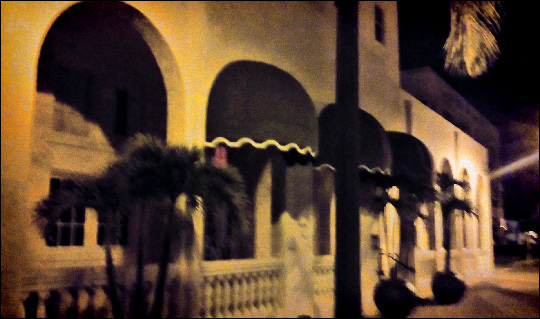 Investigación paranormal del Hotel Gulfstream en Lake Worth, Florida, el 19 de septiembre de 2015. Gracias a Robb Demarest (Florida Ghost Team, Ghost Hunters International, Haunted Australia), y Scottie Burns de War Party Paranormal por invitarnos para investigar este lugar histórico con ellos! Equipo: Sangean DT-200X para transcomunicación instrumental (TCI), Paranologies 360 Parascope, Ovilus 4, GoPro espectro completo.